Tetra fish are popular among both beginner and advanced fish hobbyists, partly because of their bright colors and active behaviors. Sizes and colors vary among tetra species. Nearly all tetra species do well in schools, so keep five to six of the species you choose. With the proper aquarium setup and diet, tetras tend to be hardy fish; many species can live up to 10 years in a healthy aquarium. Neon tetras are among the most popular tetra fish. Tetras are among the most common types of freshwater fish found in home aquariums. They are relatively small aquarium fish. The most popular tetras include neon tetras, glow light tetras and the cardinal tetras. Others in the trade are painted glass tetras, black skirt tetras, rosy tetras and red-eye tetras. Most tetras are fairly docile fish, but some, like serpae tetra, are prone to nipping fish with long, flowing tails. When you're setting up an aquarium, make sure all the tetra species you keep cohabit well with other fish in your tank. Serpae tetras can be nippy with long-finned fish. The larger the tank the better. Even though tetras typically are only a few inches long, a larger aquarium is easier to maintain. If you want to start with a smaller, 20-gallon tank, you can keep about 10 small tetras. Pace your aquarium on a sturdy stand away from windows. Set up an aquarium light on a timer for about 10 to 12 hours of light a day. Use an aquarium heater to ensure that the water temperature ranges right around 78 degrees Fahrenheit, ideal for tropical fish like tetras. And, set up an air pump to boost oxygen levels in the water. Place an inch or 2 of aquarium gravel at the bottom of the tank. Gravel will help break down fish waste, uneaten food and dead plant parts. If you choose not to use gravel, clean the aquarium more often. Decorate the tank with castles, plants, pirate ships and so on. Seat the decorations as close to the bottom of the tank as possible so the gravel will secure the decorations in place. If you have too many decorations, you will reduce the area the fish can swim in -- and that can increase their stress levels. If you want to add multiple pieces, select pieces of varying heights. Consider real plants over artificial plants: Live plants will help balance biochemicals and maintain nutrients in the water. Black skirt tetras are peaceful schooling fish. Perform 10 percent to 25 percent partial water changes one to two times a month. Do not overcrowd your aquarium. Overcrowding with too many fish can decrease the quality of the water. Stick with the tried-and-true formula: 1 gallon of water per 1 inch of fish length. Ten 2-inch fish require at least 20 gallons of water. Red eye tetras do well in large community aquariums. Do not overfeed your fish. This will lead to uneaten food rotting at the bottom of the tank, fouling the water. Feed only as much as your fish will eat readily in about two minutes. 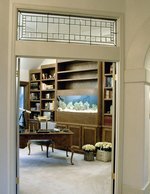 Regular maintenance will keep your fish and aquatic life healthy. Anchor Worms are introduced to the water by infected fish. You may see affected fish scratching against the glass or decorations, or you may notice whitish-green threads coming off their scales. To treat anchor worms, you'll need to treat the entire aquarium and all the fish. Add a commercially formulated treatment for anchor worms. Fungus issues usually develop when fish are stressed, have parasites or are living in poor water conditions. You'll see gray or whitish growth in or on the scales. Quarantine infected fish and perform a partial water change in your main aquarium. Treat the infected fish with a commercial fungal treatment. Ich is among the more common fish illnesses; it usually attacks stressed fish. You will start to notice white spots on your fish, and your fish may start scratching. You can treat ich many different ways. 1) Raise the temperature for about 10 days to speed up the parasites' life cycle. 2) Add 2 to 3 tablespoons of aquarium salt per 5 gallons of water for about 10 days. 3) Use a commercially formulated ich treatment and follow the directions on the bottle. Fin, tail and mouth rot is a common bacterial infection that can cause the fin, tail and mouth to rot. It's more common when a bully fish picks on other fish and when the water quality is poor. You'll notice frayed fins, faded color and overall deterioration of the tail or fins. If you notice that there is a bully in the aquarium, remove him so you can treat the fish with the rot. To treat the sick fish, perform a partial water change, add aquarium salt to the tank and consider treating the water with a bactericide such as Myxazin or Melafix. Other signs of illness to watch for include elevates scales and loss of appetite.